The Tigger'nator » Youth Explosion!! It's that time of year again! where God gathers with the youth and leaders, pretty much everyone! It's like a reunioin!! Yay!! 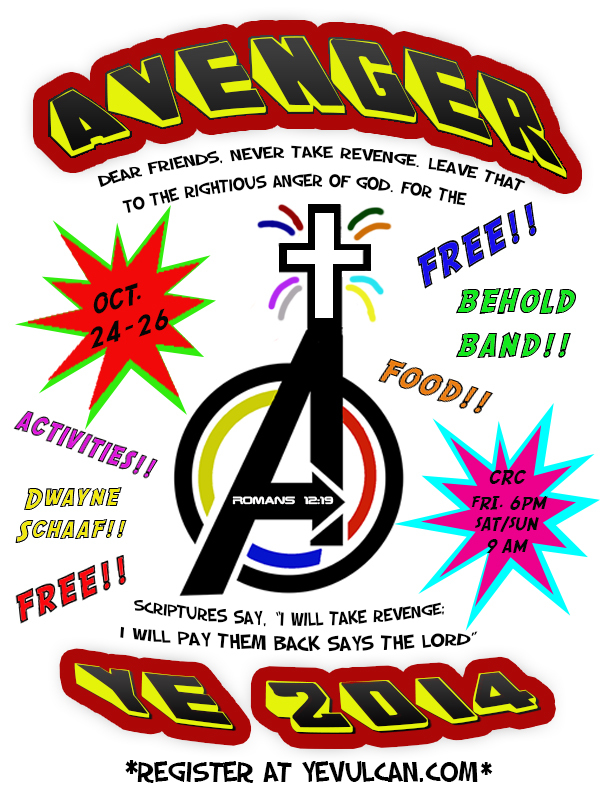 Tell your youth groups and leaders about YE, the theme is Avenger, with all this super hero stuff going on and movies out htere why not do a theme like that. Except not so much of the worldly side of it, that we have to be very carefull not to copy the world as you could say. The team agreed on Avenger to teach and show kids that htere is a true Avenger that will take care of trouble for us and not take it in our hands. The saying gose God dosn't give us what we can't handle. So come on down and find out what you can learn from this year at Youth Explosion 2014!! This entry was posted in Images, Random Stuff and tagged Avenger, awesome! Praising God, Youth by Tigger. Bookmark the permalink.